The Vikings hit the practice field for their final night practice of training camp. The team worked on many situational drills and also started the practice with a team 1-on-1 drill. Daniel House takes you inside his notebook from the night session. The Vikings hit the practice field for their final night practice of training camp. The team worked on many situational drills and also started the practice with a team 1-on-1 drill. The energy was high on the field as the Vikings practiced on Tuesday, before their off day on Wednesday. Teddy Bridgewater threw two interceptions in team drills during the night session of practice. On the first throw Kyle Rudolph stopped his route in the middle of the field and Bridgewater anticipated he would finish the crossing pattern. He didn’t and Bridgewater threw the pass into the hands of Audie Cole at middle linebacker. Later in practice, Bridgewater tried to throw a pass to the front corner of the end zone, but Xavier Rhodes had good position and hauled in a leaping interception. Neither of these throws were particularly bad decisions and they came in situations where the ball needed to be thrown quickly. The interception to Rhodes came towards the end of the 2-minute drill and Bridgewater was trying to force the throw into the end zone for the score. Mike Kafka had his best practice of training camp tonight. MyCole Pruitt ran a wheel route and got two steps on DeMarcus Van Dyke. Kafka threw a perfect pass and hit him in stride down the sideline for a would-be touchdown. Taylor Heinicke didn’t have his best practice tonight. He overthrew some passes and several plays were stopped to correct the alignments on the field. Both Kafka and Heinicke will see extended action in the preseason and it will be interesting to see how they handle live NFL action. Jerick McKinnon had more issues in pass protection in last night’s practice. He managed to hold his own with Harrison Smith, but Brandon Watts and Robert Blanton blew past him on the next two reps of the drill. McKinnon is trying to take on linebackers and isn’t using a center of balance or punch to aid him from stopping the pass rush. Zach Line continued to struggle in this drill, as well. He was beaten on all three occasions in the 1-on-1 drills and hasn’t handle pass protection well at any point of training camp. All of the running backs have had problems pass protecting, but Matt Asiata and Adrian Peterson have had the least amount of trouble with this. The wide receivers started practice in individual work with a gauntlet style drill. They were asked to catch passes as they sprinted laterally from cone-to-cone. At one point, Cordarrelle Patterson got the crowd going when he caught all of his passes and threw each of them into the stands afterwards. He dropped just one pass in the drill, but catching passes has never been a problem for him. The key to his performance will be route running and he has looked much-improved in that aspect of his game this season. Adam Thielen ran the drill and was extremely quick when moving laterally. He caught each of the passes and was certainly a crowd favorite from the Mankato faithful. Stefon Diggs wasn’t flashing as much last night, but did manage to get open on a corner route over Andrew Sendejo. Kyle Rudolph was getting open and saw more passes in the offense last night. He hauled in a touchdown in the red zone drill on a crossing route. He beat Robert Blanton in the end zone and Bridgewater found him for a touchdown. Later in the practice, he ran an out pattern towards the sideline and made a nice catch in traffic over linebacker Gerald Hodges. The only flaw we saw from Rudolph came when he stopped his route and Bridgewater threw an errant pass for an interception. If he would have finished his route, the throw would have never been intercepted by Audie Cole. Nonetheless, this was the most active we’ve seen Rudolph in the passing game thus far and he didn’t look bad in the team drills. Phil Loadholt continues to dominate every drill in training camp. In team drills, he laid a beautiful block in the second level to open a hole for Adrain Peterson. Later in the session, he forced Brian Robison to the outside on an inside rush stunt. Brandon Fusco did more of the same and continues to look comfortable on the left side of the offensive line. He pancaked Chad Greenway to open a lane for Jerick McKinnon in the running game. Fusco didn’t allow a quarterback pressure in team drills and has been doing a nice job of trying to help Matt Kalil on the left side. After starting camp strong, Tyrus Thompson has really struggled down the stretch. In work with the third team at left tackle, Thompson was beaten twice by Caesar Rayford in the final session of team drills. He was beaten off the edge and hardly gained any initiation with Rayford off the snap. To start practice, the entire team huddled around T.J. Clemmings and Danielle Hunter at the 50-yard line as they battled 1-on-1. Hunter beat Clemmings off the outside on the first try, but on the second occasion, Clemmings got the best of the him. After those two worked the 1-on-1 drill, the players roared and moved onto their individual position drills. In team portion of practice, Tom Johnson was consistently getting a great push in the interior. He entered the game when they were simulating third-and-long situations and blew past Tyrus Thompson for a would-be sack. 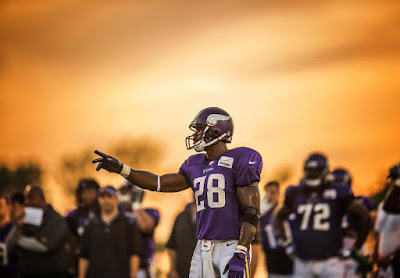 Later in practice, he beat Mike Harris off the ball and pressured Bridgewater to check a pass down to Adrian Peterson. Sharif Floyd was knocked to the ground following a running play. He was on his knees for a few moments, while the medical staff came to check on him. After a few minutes, Floyd stood up and walked off the field under his own power. Caesar Rayford continued to perform well in the pass rush and would have had two sacks on Taylor Heinicke in the final 11-on-11 session. In a drill that emphasized run defense, Eric Kendricks looked fantastic at filling the gap. He quickly shuffled into a hole and wrapped up Matt Asiata at the line of scrimmage. On the next rep, he found DuJuan Harris who was cutting the run to the outside. Kendricks again shuffled into the mix with the first team nickel package in team drills. In the second team session, Audie Cole intercepted an errant Teddy Bridgewater pass. Cole continues to flash his coverage abilities and more importantly, is an even better run defender. Last night, he filled the gap on a Jerick McKinnon run and stopped him at the line of scrimmage for no gain. Last night, Xavier Rhodes was knocking away passes again in the secondary. He also added a leaping interception on a Bridgewater pass intended for Mike Wallace in the front corner of the end zone. Earlier in practice, Rhodes knocked away a pass on a wheel route to Charles Johnson, but likely would have been called for pass interference in the process. Rhodes has been shutting the door on passes thrown towards his side of the field and the coaches have been continually praising him for his attention to technique. Trae Waynes worked on the outside with the second team and his most notable play came when he defensed a pass intended for Cordarrelle Patterson. Waynes is getting in better position, but was beaten by a small step on a few occasions in team drills. Nonetheless, he is improving and is making more plays by using his physicality and athleticism to his advantage. Andrew Sendejo simulated a blitz in a 1-on-1 drill with the running backs. He put a sweet move on Joe Banyard and swam into the interior with a swivel of his hips. Sendejo also made two run stops and has been recognizing those plays very well. Robert Blanton also handled the 1-on-1 drill well and won two of the threes battles against the running backs. As I said in my last notebook, preseason performance will play a pivotal role in how Mike Zimmer will structure the strong safety position this season. In live kicking drills, Blair Walsh finished the night 7-for-8, with his only miss coming from 54 yards out. During this session, Cullen Loeffler and Kevin McDermott rotated snaps and the lone kick Walsh missed came when Loeffler was playing long snapper. Sharrif Floyd left injured, but walked off under his own power. David Yankey left with an injured ankle, but limped back onto the field to watch the remaining portion of practice. Anthony Barr, Scott Crichton, B.J. Dubose, John Sullian, and Josh Robinson were all sidelined for the night practice. The Vikings are off on Wednesday, but will return to practice on Thursday with a walkthrough from 10:30am-11:30am, followed by an afternoon practice from 2:45pm-5:00pm.